It doesn’t take overly strenuous exercise to pull a muscle. A muscle pull, also called a muscle strain, can happen with everyday movements of your arms, legs, shoulders, neck, and back. The pain brought on by a pulled muscle is not sharp and intense but rather a dull, aching pain that is noticed even more when flexing, moving, or applying pressure to the muscle. A pulled muscle can sometimes feel tender to the touch. It may also feel like there is a tight “knot” in the muscle. Range of motion is often restricted with a pulled muscle. You may not be able to fully straighten or extend your arm or leg. Most muscle pulls don’t produce any visual symptoms, but a more severe muscle pull can result in the skin appearing swollen or red. Muscles that are pulled hard enough to tear apart their fibers can cause internal bleeding that produces bruising on the surface of the skin. There are a few things you can do to help reduce the risk of a muscle pull. And once a muscle pull is suffered, there are some things you can do to speed up the recovery process. Pulled muscles can be treated using the RICE method. RICE is an acronym for rest, ice, compress and elevate. Pulled muscles need rest and physical activity should, therefore, be limited. Use an ice pack on the muscle for 20 minutes at a time several times throughout the day. Use an elastic bandage to wrap the muscle for a snug (but not too tight) compression. Whenever possible, keep the pulled muscle elevated on a pillow or in a sling. If your injured muscle doesn’t feel better after a few days of home treatment, consider visiting your local FastMed Urgent Care to have it examined by one of our medical professionals. What feels like a pulled muscle can sometimes be a torn muscle or worse. At FastMed, we accept most major insurance plans, including Medicare and Medicaid. Come see why so many of our patients are happy with their experiences at FastMed. 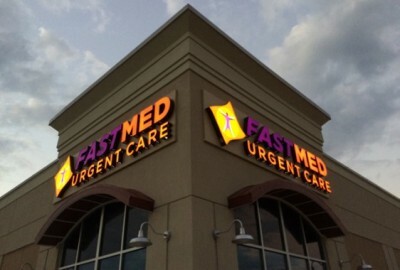 Find a FastMed near you!